Was both rewarding and frustrating at the same time. Wife kitteh, who was being a good sport, and I went out to dinner last night and then drove out to Sunrise Highway in the Laguna Mountains so I could play with my Fujifilm X-T10 camera and try to get some night sky photos. The night was moonless and clear and the place has very little light pollution, so everything was set for some good photos. I spent some time in the afternoon trying to set up the camera properly. I put it in manual mode, set the ISO at 4000 and tried to learn how to manually set the shutter speed. I was able to figure out everything but that last part. No matter what I did, the thing stayed at 1.5 seconds instead of the recommended 15-30 seconds. Lesson: Don't try reading the manual in the car at night. If you're doing that, you're doing things wrong. However, wife kitteh came home very hungry, so setup time with the camera was cut a bit short as noms were required sooner than expected. Lesson: Set up all your gear ahead of time and take some shots, even if it's in the middle of the day. I had planned to look through the manual during my lunch break and work through the settings, but, as usual, the workday had other plans and I never got to it. Hence, I was working out the settings at the last minute before we left. Lesson: If you're in the mindset that the first two or three times you try something new you're going to make a total hash of it, it's all good. I had no expectations other than figuring out what I had done wrong the next day, which is today. When you learn new things, you asymptotically approach competence as you keep trying. In the end, I was actually happy with a couple of the shots, however they managed to sneak their way into my camera in spite of my best efforts at ignorance. In the end, it was very cold up there and I was a bit unhappy with my inability to set the shutter speed, so I took some shots in random directions to use as teaching aids today. 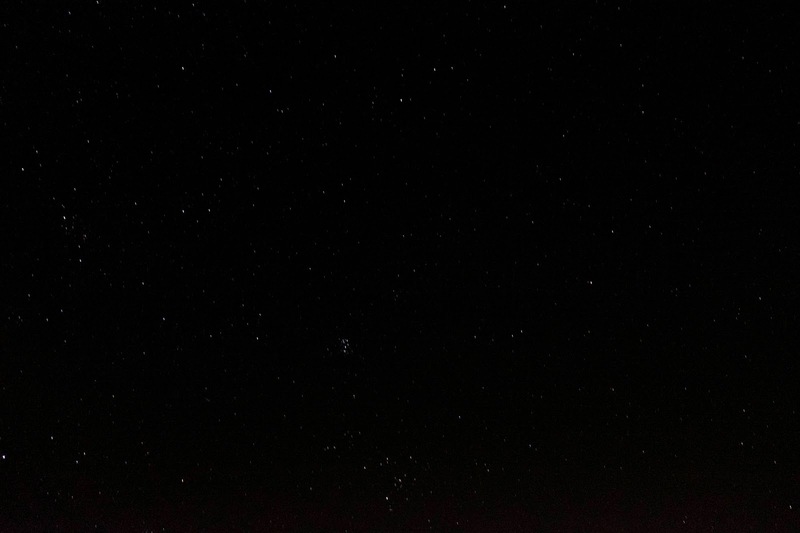 I came away with some nice full sky shots and one or two horizon ones. They're not professional grade, but they look like I meant to do them. I left these quite large, so I think they're worth a click. In fact, you'll need to click on them to see them properly. In thumbnail mode on the blog, they look like black rectangles. Enlarged, they look like black rectangles with tiny, white dots, which, I'm sure you'll agree, is much better. Enjoy. Cool, you got Taurus and the Pleiades! I like both pictures. The first is nice and sharp, while the second one blurs the stars into large enough disks that the colors are easy to see. Aldebaran is particularly nice and orange. I've played around with my old SLR digital and generally been rather disappointed with the photos I've taken during dark sky, yours are MUCH better. Thanks for the kind words! I imagine that had I gotten ten times the exposure, they'd have come out much better. I was surprised to get these, to tell you the truth. When I saw the 1.5 seconds shutter speed not budging, I figured the whole trip was a washout. Do most San Diegans even own jackets? At least it wasn't as cold as when I was taking pictures of comet Hale-Bopp. It was so cold that the shutter release was freezing up after about a dozen shots, and I was a bit concerned that the film was going to get brittle and shatter when I advanced it. Once you master the technique, you'll have to head out into the desert. 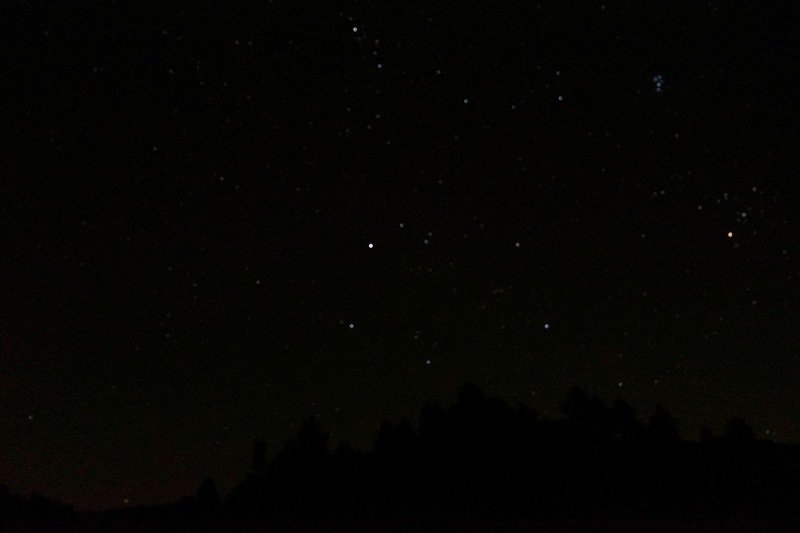 I've never seen more stars than driving across Arizona at night. It was the only time I've ever seen the Milky Way. I don't even want to think about how the sky looked back in the '40's in UK. 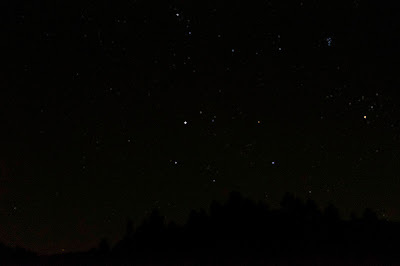 With no moon, out in the countryside, the nights were black, you couldn't see where you were going without a flashlight and the sky was a truly awesome sight. Few people have experienced that today. There ought to be a law against light at night. You have a Fujifilm XT10? Cool! According to my uncle, half of San Diego owns ski gear which they put on when it hits 50 degrees or so. 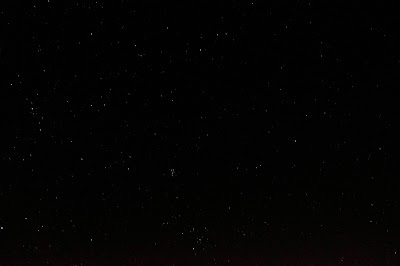 I follow shutterbug on Facebook and keep getting an ad for how to photograph the night sky. Tempted, but it costs a bundle of money.